Qatar with its capital Doha is located in Asia (Middle East, peninsula bordering the Persian Gulf and Saudi Arabia). It covers some 11,587 square kilometers (almost twice the size of Delaware) with a population of 2,314,310. Arabic and Spanish are the languages spoken by people in Qatar. Did you know that Saudi Arabia is the only bordering country. Qatar is a peninsula jutting into the Persian Gulf, to the north of Saudi Arabia, East of Bahrain and West of the Emirates.The country is surrounded by the sea so watersports are a must. Kite-surfing is increasingly popular for the westerners while the locals prefer driving jet-skis at high speed next to the beaches. Safari tours to the desert with dune-bashing in Landcruisers are popular. Visit the collection of widely scattered malls around Doha and enjoy yourself. The terrain is mostly flat and barren desert. The average density of population is about 200 per km². The climate in Qatar can be described as aridmild, pleasant winters, very hot, humid summers. Possible natural disasters include haze, dust storms, sandstorms common. To reach someone Qatar dial +974 prior to a number. The local cellular networks are operated on 900 MHz, 1800 MHz, 3G, 4G. Websites typically end with the top level domain ".qa". If you want to bring electric appliances (e.g. battery chaarger), keep in min the local 240 V - 50 Hz (plugs: G). The sign for the locally used currency Rial is QAR. 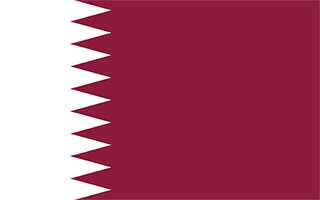 Maroon with a broad white serrated band (nine white points) on the hoist side; maroon represents the blood shed in Qatari wars, white stands for peace; the nine-pointed serrated edge signifies Qatar as the ninth member of the "reconciled emirates" in the wake of the Qatari-British treaty of 1916.